I recently read Things Unseen (A Long Forgotten Song Book 1) by C.J. Brightley. History student Aria Forsyth's studies lead her to dangerous questions about the Empire's origins. A mysterious man named Owen, impervious to the winter cold, further unravels the safety of the world she thought she knew. At first, Aria believes Owen is human. He says he's not. What if they're both wrong? A moment's compassion draws her into a conflict between human and inhuman, natural and supernatural, and she begins to discover the secrets of the Empire, the Fae, and what it means to be human. 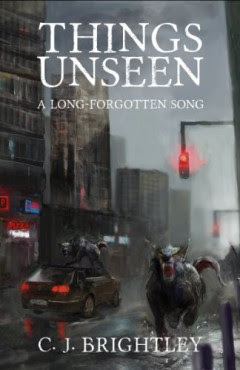 Things Unseen is an unusual blend of dystopia and fantasy. It's set in totalitarian future with a vaguely Soviet flavor. The main character is a human post-grad student who stumbles onto the existence of Fae, who are now secretly hunted by the State and used in experiments to try to harness their magic. The Fae have to ally with human resistance groups to save themselves. There's a lot of action, escaping, plotting, and all the elements of a good thriller. And there's also a lot of discussion that teases out the differences between Fae and human. And in addition to that a slow, possibly unrequited love story develops. This particular novel is not overtly Christian, but it seems to be setting the stage for theological debate as it focuses on free will as the big difference between Fae and human and other supernatural creatures. From other reviews of the sequel, The Dragons Tongue, the series does become more focused on this, and the author has told me that she considers it a Christian series. I enjoyed this novel a lot. It was a different take on urban fantasy. I liked that the main character, Aria, is a thinker, and often makes understandable blunders. She's not a Mary Sue. The Fae characters are not the typical shiny pretty people with powers, instead they seem really different in thinking, almost alien. This was a good read and I look forward to the rest of the series. I actually read this novel as part of the Urban Mythic boxed set. Urban Mythic: Thirteen Novels of Adventure and Romance, featuring Norse and Greek Gods, Demons and Djinn, Angels, Fairies, Vampires, and Werewolves in the Modern World. Twelve more books to go in that set!